Rapper Daniel Butterfield—aka Vince The Messenger—is one of Charlottetown’s newest and most influential musicians in the Island’s hip-hop scene. Coming hot off winning Urban Recording of the Year at the 2019 Music PEI Awards for his debut full-length album Self Sabotage, Vince plans to continue spitting out meaningful lyrics and turning heads. Now 21, Vince is regularly releasing new material and gaining listeners. It was always going to be rap for him, said Vince, as it’s always what has felt very natural. While Vince writes all of his own lyrics, his songs to date have mainly been produced by Niimo, who performs locally under the name Marquis & The Squid. “He’ll make beats, send them my way, and then I’ll write to them,” says Vince. Vince thinks his best songs are created when he first hears the beat and immediately has some ideas to spit out. “I kind of go into it a little bit blindly. In an ideal setting, I’ll play the beat, and then whatever emotions or thoughts will strike me after listening to the beat will be the first things to come out.” Vince is currently working on a new album, which is being exclusively produced by Niimo, expected to be released within a couple of months. On top of that, Vince is also collaborating with Marquis & The Squid on an joint EP, collaborating with Kit Moro on another joint EP, as well as producing an EP on his own—all four albums are expected to be out this year. On PEI, Vince recognizes that while diversity is growing in the music industry, there are still only few people of colour. “You’re clearly different. From a superficial standpoint, you’re automatically different. 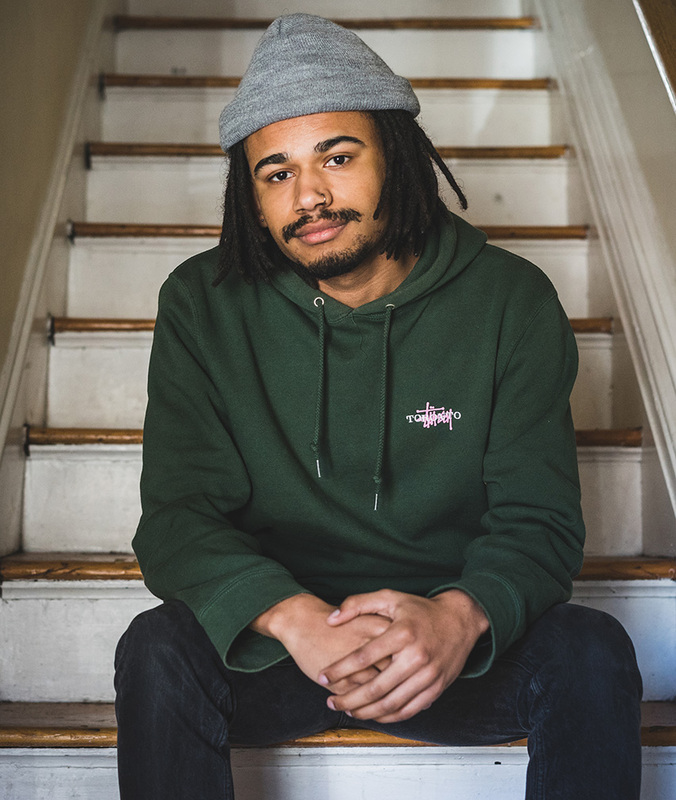 In terms of music, rap feels like the main genre where black people are properly able to express themselves.” Vince is happy to see that the black music community is growing and coming together more and more on PEI as people continue to immigrate here, contributing to the Island’s ever-growing multiculturalism and diverse music scene. Still on the heels of winning a Music PEI Award, Vince said the experience has, “Started to slowly open up some more doors and set more eyes on me, which is good to help get myself out there. It felt good to get the recognition from a group of musicians.” Vince was also nominated for the Holland College/Lloyd Doyle New Artist of the Year. Listen to Vince The Messenger sling rhymes over boom-bap beats on Self Sabotage on Spotify. Evan Ceretti is a photographer and writer based in Charlottetown. He’s a proud vegan, guitar player in local band Ultrasvede, an ultimate frisbee and disc golf enthusiast, and lover of this Island’s endless beauty. One of his greatest passions is traveling, which has taken him to 6 continents while racking up 1100 days of international travel. A graduate of Holland College’s journalism program, and of UPEI’s print journalism program, Evan enjoys writing about the local food and music scene, and capturing the Island's essence in photos. He operates Evan Ceretti Photography, and you’ll most likely see him strolling around town, camera in hand. Check out his work on Instagram @evanontheroad.